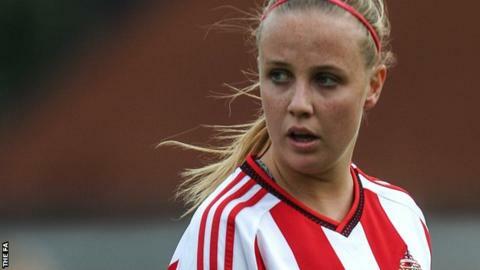 Beth Mead, the leading scorer in Women's Super League One, has signed a new four-year contract with Sunderland. The new deal will see the 20-year-old striker stay at the club until 2019. Mead has netted 11 times in WSL 1 so far this season, including a hat-trick against leaders Chelsea, to help put her side in contention for the title. Despite being tipped for a first senior England call-up, she was not included in the squad to face Estonia in a Euro 2017 qualifier on 21 September. Sunderland have reportedly turned down a bid from Arsenal Ladies for Mead. "We're delighted that Beth has signed a new deal - she is one of the best young players in the country," Sunderland manager Carlton Fairweather told the club website. "Naturally, with a player like Beth, there has been interest from other top-flight clubs. So for us to secure this signing shows exactly where we want this club to be."